It's the same every year, you get back from your holiday with lovely sunkissed hair. But even though you'd like this radiant colour to last all year, it doesn't! Here are some techniques to help you prolong the sun's benefits when you get back from the beach. Unfortunately there are no products that will prolong the sun's benefits. "There are products that lighten hair slightly, others that will give your hair a nice glow, but none can claim to prolong the sun's benefits. Carry on using your usual products at home to suit your hair type. This will keep your hair looking nice and shiny." Your hairdresser can help keep your colour looking healthy with salon treatments. "He or she knows what techniques to use to bring out radiant streaks that last. These techniques last a few washes. 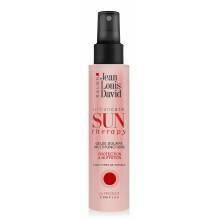 The Color Therapy range from Jean Louis David will give you radiant hair and can be used in the salon and at home. To keep your hair looking radiant, avoid using products designed for your hair colour. "A lot of women think that colour-related products give you a healthy colour. But this is not true, and the result is often disappointing. Instead, choose a range of products designed for your hair type. However, if you're looking for products that will revive the pigments of your colour, head to your salon, your hairdresser will know what to do."